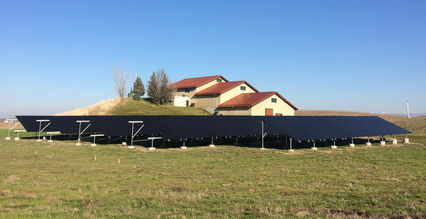 Pepper Bridge Winery recently completed a solar installation project consisting of 378 panels, making it the largest photovoltaic solar array in Walla Walla County. The 100-kilowatt installation, which is ground-mounted adjacent to the winery, will have an annual production of over 100,000 kilowatt-hours and is projected to provide 70% of the winery’s energy needs. Partner and winemaker Jean-François Pellet spearheaded the solar project. He studied the environmental impact and reviewed the feasibility of the technology to ensure it was the right investment for the family-owned business. Thanks to a USDA Rural Energy for America Program (REAP) Grant, the winery received funds to be used towards the purchase, installation and construction of renewable energy systems. Pellet and the Pepper Bridge Winery team wanted to ensure the project would embrace local businesses. Northwest-based North Coast Electric planned and built the system and Walla Walla Electric completed the installation. North Coast Electric distributes solar and electrical equipment throughout the Pacific Northwest and can help with project design, grants, and funding for your residential and commercial installations. North Coast is a trusted advisor for all of your solar needs. Contact us today to learn more: 503.630.2770 or solar@ncelec.com.